Traditionally made with ground beef or lamb, Persian Kofta Kebabs are a delicious way to prepare ground meat. The flavors are fantastic, and they are incredibly easy to make. A much more naïve version of me had these kebabs on my first trip to Israel, and I was confused as to why the “kebab” I ordered was ground meat, instead of the lovely little cubes I was used to. And that became my first lesson in the Kofta (or Kofte) Kebab. The origin of the word köfte is the Persian word “kufteh” meaning “mashed”. In old times, since people did not have meat grinders, they minced meat to very small pieces and then mashed them in large mortars. I fell in love with these delicious skewers of meat, and I’ve been hooked ever since. Now, there’s a Middle Eastern market a few blocks away and I often go there and indulge in their ground beef Kofta Kebabs — they are so amazingly good. But definitely not low calorie. So to keep myself from consuming too many Weight Watchers Points, I decided to experiment a bit and create a version using lean ground turkey. In order to keep the turkey from getting dry, I also added some shredded zucchini into the ground turkey. And while my picture didn’t quite turn out so well, the taste was fantastic! And it added up to just 4 Points per serving. My husband really likes his meat charred, so I cooked the ones you see in the picture for a bit longer.I served these with some low calorie tzatziki sauce, and they were a hit. If you are looking for a unique ground turkey recipe to try, these Kofte kebabs are a perfect idea! 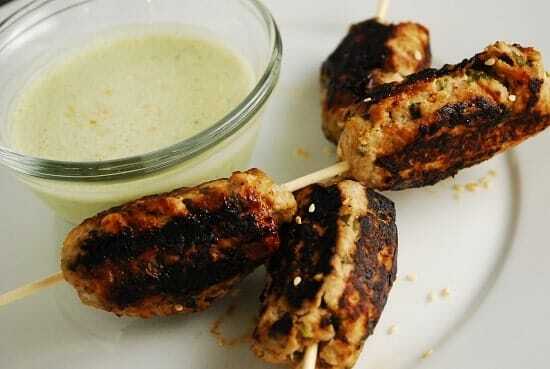 An easy and delicious Kofta Turkey Kebab Recipe that has just 4 Points per serving. Spiced with Middle Eastern flavors, these turkey kebabs are a the perfect low calorie summer grilling recipe. Combine all ingredients together in a large bowl, cover with saran wrap or lid, and let sit overnight for the flavors to saturate the meat. Then, form 12 log shaped kebabs and skew them. If using wooden skewers, make sure to soak them for at least 30 minutes in water to keep them from burning on the grill. These can also be grilled without the skewers as well, if you prefer. Cook on grill for about 12-15 minutes, turning occasionally, until the meat is cooked through.